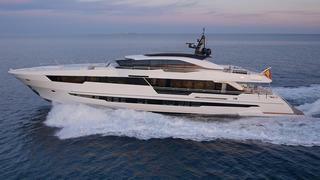 Sea trial photos have been released of the first hull of the new 110 Century series. 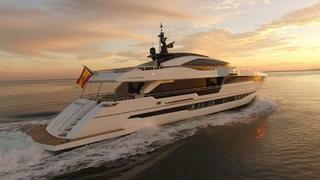 The yacht was launched in January by Spanish yard Astondoa. 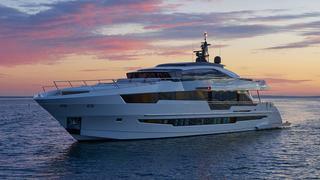 The 33.5 metre semi-custom yacht will be officially revealed at the Yachts Miami Beach show (February 11-15). The launch marked an important moment in the history of the Astondoa shipyard as it celebrates 100 years of yacht building this year. Having made the transition from the wooden yacht era to building composite yachts, Astondoa then entered into the world of superyachts in 2007 — with launches including 43.5 metre Samurai One and 45.5 metre Amaranta P (now Panakeia). The 110 Century features large sun pads on the foredeck and aft of the fly bridge, providing outdoor areas for guests to relax. On the flybridge an electric roof can be opened over the covered forward part when the weather is good. 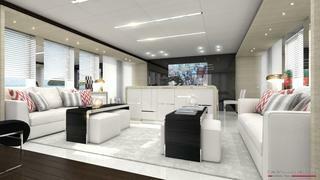 If preferred the roof can be closed to provide a glass walled, air conditioned sky lounge. This versatile space also features a bar, BBQ grill and al fresco dining for guest entertainment. Two personal watercraft are kept under the foredeck and a Williams jet boat is stored in the aft garage. The easily accessible swim platform is reached from the aft deck, which features a second outdoor dining option. 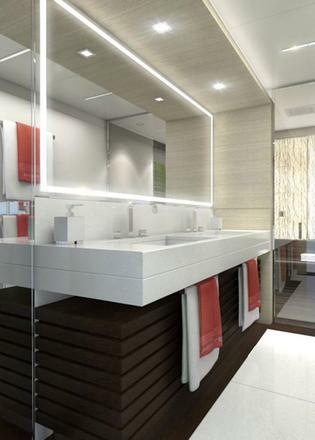 The interior, designed by Cristiano Gatto, is created to be clean, uncluttered, modern and low maintenance. Rich, touchable textures contrast with high tech elements, including the big screen TV that doubles as a black glass wall. Gatto explained how “the owner wanted it to feel like guests were onboard – not in a NYC apartment”. The main deck features a full beam master suite with panoramic views, while on the lower deck two queen and two twin staterooms provide accommodation for up to 10 guests. Sofas in the lounge can convert into beds to create additional sleeping space. The engine room houses two MTU 16V2000 M84 engines, giving the 110 Century a top speed of 24 knots. 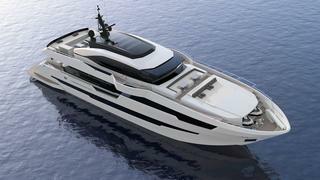 It also has a draft of just 1.8 metres, ideal for shallow water cruising. 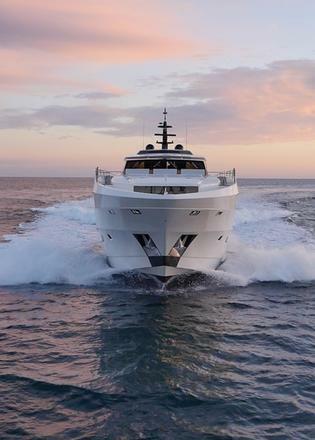 The 110 Century will be displayed at Yachts Miami Beach with G Marine, who believe Astondoa have managed to put the features of a larger yacht into a functional smaller yacht.